Many Protestant churches in D.C. follow the same mode: gather on Sundays for clergy-led worship, stay about two to three hours, and then go home. For most of the worshipers, church is finished for the week. Their religious obligation is complete. Back to their regular lives. However, I know of at least two congregations in the D.C. area that have taken enormous leaps and bounds away from the traditional, institutional church model (I may, with their permission, profile one of these congregations in a future blog). To the casual observer, these churches may appear to be strange, even heretical. In fact, they are far from heretical (although I admit they are strange, in the sense that they are unusual expressions of the church in the D.C. area), and are wholly committed to preaching the gospel of Jesus and affecting lives in the city. These congregations gather for worship as a corporate body on Sundays, usually late in the afternoon. They own no building, and are likely not interested in owning one. They meet in rented school buildings or office buildings. Their services are usually short, between an hour and two. In addition, unlike many congregations in D.C., one would be hard-pressed to find anyone wearing a suit or a fancy church hat (a casual shirt and jeans are more commonplace). What is most striking is that, for them, church does not end there. In fact, it is just the beginning. An essential part of their worship is community groups that gather weekly in various homes around the D.C. area. These gatherings are the continuation of worship that occurs on Sundays. In these meetings, they pray, they praise God, they sing, they eat, they study the Bible, they might even play a game or discuss an impactful movie or TV show. But they do not exist just to have meetings. Each group has a mission, unique depending on the neighborhood, to impact the community and the culture through the gospel. These meetings are the personification of fellowship and community, and closely mirror the model of church presented in the Acts of the Apostles. No doubt, these congregations have broken from tradition and are hewing more closely to the New Testament model of church. And just what is that model? Pastor J. Todd Kingrea, in his new book, “Carrying on the Mission of Jesus: Rediscovering the mission, identity and purpose of the church,” takes the reader through a series of devotionals that cover the entire book of Acts. His premise is that the modern day church has been largely operating on the wrong model for 1,800 years and that God is calling the church back to the model and purpose of the New Testament church. 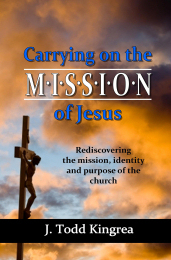 Carrying on the Mission of Jesus, available on Amazon.com and B&N.